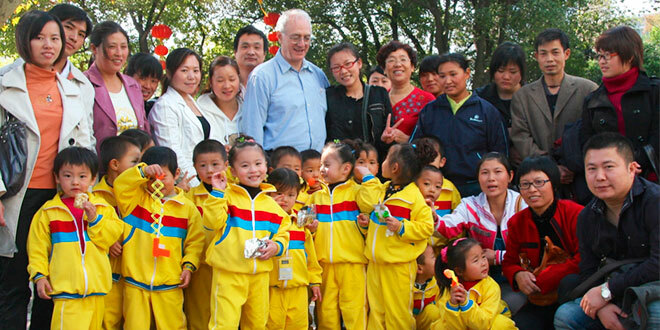 Good shepherd: Columban Father Warren Kinne amongst his flock in Shanghai (at left and below). COLUMBAN Father Warren Kinne knows first hand the art of “playing the game”. 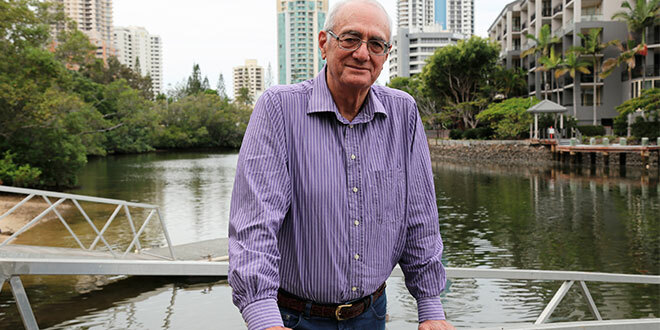 For two decades, Fr Kinne, 71, born and bred in Bundaberg, Queensland, was a missionary in communist China, learning to tread lightly, sometimes testing the boundaries of authority and control, and eventually watching his mission flourish in unimagined ways. Now returned to Australia, with a new mission and living on the Gold Coast, close to his family, Fr Kinne can reflect on the challenges of the sometimes thriving, sometimes repressed Catholic Church in China. He chuckles as he considers his own journey to China where he was officially registered first as a student, a teacher and finally a businessman, but never a priest. After graduating as dux of Christian Brothers’ College, Bundaberg, Fr Kinne studied to become a Columban priest. None of this, Fr Kinne said, prepared him for his mission in China. After acquiring some Mandarin skills, Fr Kinne moved to Shanghai to work with a publishing company, Guang Xi Press. There he taught sisters and some priests English, and helped with translations. He started teaching philosophy at Fudan University, making connections with students and the wider community, and slowly introducing students accustomed to Karl Marx and Chairman Mao to the teachings of Church doctors like St Thomas Aquinas and St Augustine. Good shepherd: Fr Kinne was a good shepherd to the needs of migrant children. Fr Kinne said students were open to learn the historical Christian underpinnings of the West. “I found it was all part of playing the game, testing the boundaries and getting accustomed to the place,” he said. In Shanghai, a thriving metropolis of 23 million, Fr Kinne found he was the only native English-speaking priest. His services were in high demand for celebrating Mass, and his humour and wit greatly appreciated by parishioners. The Columban Missionary Society, which sent its first missionaries to China in 1920, was expelled along with all western missionaries after the Communist Party came to power in 1949. It wasn’t until the 1990s that the Columbans returned – Fr Kinne among them. “I stood out like a sore thumb,” he said of his early experiences. Fr Kinne soon made friends in all walks of life – the noodle maker in the shop he regularly visited for a bowl of steaming Hunan noodles; his Chinese “mother” Zhou Rui Lan, an elderly woman who got to know him passing her house each day; as well as countless students who remained firm friends long after they graduated, married and started families of their own. 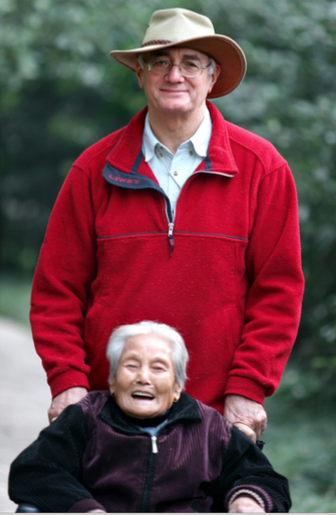 Friends: Fr Warren Kinne with his Chinese “mother” Zhou Rui Lan, who has died. Photo: Supplied. He also became known for riding his “electric donkey” – a small battery-operated electric bike, which enabled him to navigate the huge city. “The taxi is slow, but on the ‘electric donkey’ you can nip in and out,” he said. Through his many experiences, Fr Kinne came to learn China’s complex balance of state control, which allowed the Church to openly grow and flourish in some regions, while elsewhere it was driven underground, and any sign of challenge to authority was met by a swift crackdown by communist officials and police. Fr Kinne said he had little contact with the underground Church – to do so could have been dangerous for its members. Instead, his missionary work developed in another direction. As Shanghai grew into a global financial hub and a showpiece of the booming Chinese economy, Fr Kinne witnessed the growth of the city’s underclass – migrant workers brought in from the countryside as cheap labour to build the gleaming skyscrapers and tower blocks. Described as Shanghai’s “floating population”, these rural migrants now number about 10 million. Even today they lack residential status and are relegated to the worst, lowest-paid jobs. Fr Kinne saw a deep need amongst Shanghai’s migrant workers. “The government wanted the workers, but it didn’t want the consequences of the workers,” he said. “I saw them living rough and working on building sites and in the restaurants. I thought if the Church is for the marginalised, these guys certainly fit the category. With a group of like-minded friends, particularly amongst the Catholic expatriate community, Fr Kinne set up the You Dao Foundation – a charity business to help provide migrant worker children, barred from attending Shanghai schools, with places to learn, and supplied them with books and other needs. 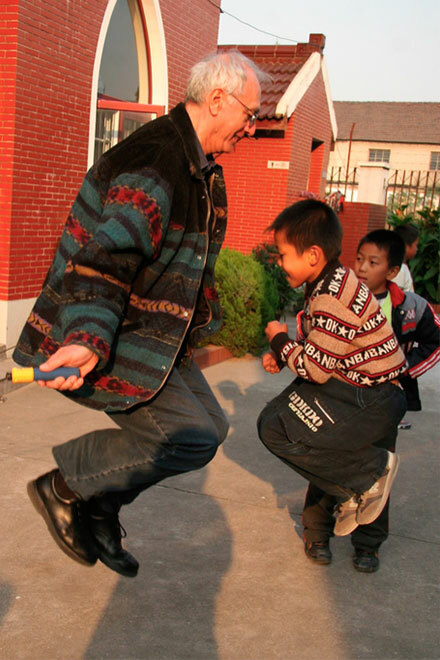 Active ministry: Fr Kinne works with migrant children and their families in China. As You Dao chairman, “businessman” Fr Kinne found innovative ways to help the poor learn – by partnering migrant children with some of the rich foreign schools set up for a large expatriate community. He found ex-pats willing to fundraise to provide scholarships that would pay for expensive school tuition fees for migrant children to attend private schools, and provide clothing, books and computers. International business corporations based in Shanghai also started to help in various ways. 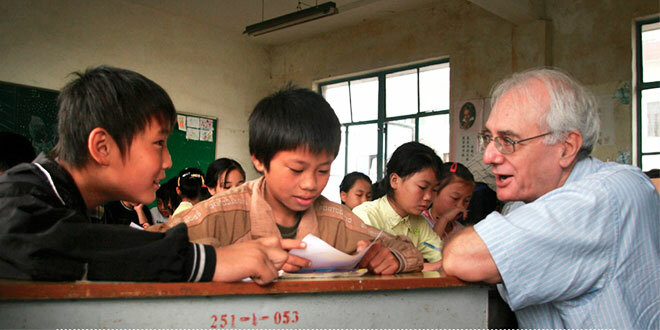 The You Dao Foundation has operated for more than a decade, providing education opportunities for Shanghai’s poorest. This has included giving out hundreds of scholarships. Through charity work and donations, it also delivers other, practical help for migrant worker families – health checks, food, clothing and home goods. You Dao is now firmly established. While it was originally registered in Hong Kong as a foundation, it recently became registered as a “service organisation” on the Chinese mainland. Fr Kinne said the Church in the city was “healthy and alive, moving ahead quietly” with about 140,000 Catholics practising their faith. At the start of this year, Fr Kinne was sad to leave Shanghai as a “businessman” and return to Queensland. Brisbane Archbishop Mark Coleridge, who Fr Kinne met in Rome while studying many years ago, was quick to enlist his skills by appointing him as a chaplain at Griffith University. It’s a chance for Fr Kinne to keep his China connection alive, with more than 900 Chinese students studying at the university’s Gold Coast campus.